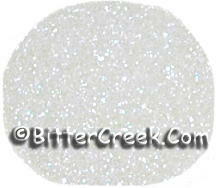 Precision cut Iridescent Glitter particles consisting of a Polyester/Acrylic optical core with a polyester outer layer. Excellent for decorative and water based applications. Beautiful in body lotions, body glitter and clear mp soap and gel candles! Directions for use: Add our Glitter to lotion bars, lotion, hand sanitizer, soap or anywhere you want a bit of fun! Glitter also looks great in gel candles! Uses: Colorant for soap and other cosmetic applications. Warnings: Wash hands after handling.Wearing a face mask or respirator while working with glitters is recommended. This product is not approved for use on the lips or eyes and may cause irritation to those areas.